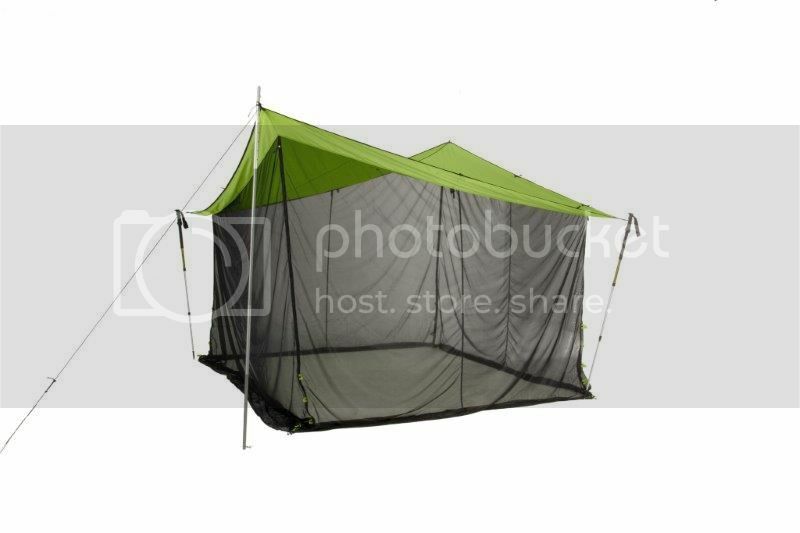 Post subject: Who designed the MEC Mantis tarp bug shelter? Ummm....the guys at MEC, I am guessing. I would bet it was a team effort. My guess is that whoever designed the Mantis was just looking at the VCS and made some adjustments. The 3lb list weight is for the Eureka mesh room only. The Tarp is another 4.5lbs and has to be bought separately. The whole setup is quite bulky as well. When you add the two pieces together, the price and weight is similar to the MEC Mantis Tarp. Once you get past the weight and bulk, the Eureka is a nice unit. It works well and is easy to setup once you get used to it. We had 4 people in it, but I think you would still be comfortable with 6. I've never used the Mantis tarp, but I image the low corner would eliminate a lot of useful space. Though being free standing would be nice. I also believe MEC designs their gear in house. They don't just put their name on another companies product. It is my understanding that the MEC Mantis was designed for Arctic paddlers. It works very well in the Far North. It's a tarp shelter for wind and weather (rain) but it can also serve well as a bug shelter or even as an overnight sleeping tent shelter. It is easy to adjust the height depending on the wind conditions. It's not freestanding but it is simple enough to set up in all weather conditions in my experience. True, it was most likely designed in-house. Just wondering who was the designer or design team. There are some that like the Mantis and there are others such as myself who think it's junk. I used one a number of years ago for a three week trip where trees were generally not available. What a disaster! I'm one of those canoe trippers who like it. I've used it in NWT and NU. Lakes, rivers, ocean. Month long trips. It's never failed. I'd like to pass along my sincere thank you to the designer. I think you won the thread. 1) It is very difficult to thread the pole through the sleeve which is too narrow. 2) It is not very useful for any more than two people. 3) It is not great in the wind. It requires alterations to add guy point and reinforcements to make it passable in the arctic. 4) Almost all of the area under the tarp has a very low ceiling. The height cannot be increased very much since then the bug-net sides would be off the ground. The criticisms above aside, if you think of this tarp as refuge to sit away from rain and bugs, or to cook a meal "indoors" and away from your tent, I have found it indispensable. I also find that it can be significantly warmer inside the tarp, especially when cooking. The Nemo shelter cannot be had in Canada. The material did not pass Canada's fire retardant standards and they will not allow it to be imported. It is a nice unit otherwise. What? Heck its nylon. I would think it all burns about the same. Just saw a Nemo 9x9 Bug Out shelter at Algonquin Outfitters near Dwight. It looks to be very well designed and the price point seems reasonable ($250). Walls might be a little low on the corners (4'). Anyone have experience with this tarp? I also have the Mantis. Over a decade now. The pole sleeve has never been a problem, but there must be some variability in the sleeve width as quite a number of people have complained about this. It's too warm for southern Ontario summer camping, and too low for hanging out, hence my interest in the Nemo above. But for storm and wind protection, the Mantis is a reliable shelter. My recollection is that the pole sleeve diameter on the Mantis was made larger at some early production point, as difficulties in threading the extremely long pole through the too narrow sleeve resulted in numerous complaints. I had one for several years and used it occasionally. It was a first year Mantis with the too-tight sleeve and I disliked it for that reason alone, especially when trying to extract the pole from the grippy, worse when wet sleeve. I eventually gave it to a friend who (thought) he liked it. He gave it to another friend. The long pole sleeve being the biggest hassle. That pole attachment should be sleeves at the last foot or so on each side and clips across the rest of the run of pole. That alone would make set up wayyyy easier. It could use some kind of simple covers over the screendoor in case of windblown rain. Those wouldn’t need to be zippered or velcro’ed, maybe just a simple overlap between two triangular side pieces that could be tied off open on either side or tied closed in windy rain. That door cover could be vee’ed and staked a bit further out than the screen for a pseudo front vestibule, which would help make yawning mouth less of a windcatch when the breeze changes direction. One of my biggest complaints with the Mantis was when a front moved through and the wind changed direction. I couldn’t simply drop the other end as with a tarp and I sure as hell wasn’t pulling all the stakes or sod and spinning it 180 degrees. A couple of interior webbing loops to allow hanging a ridgeline or etc inside. I recall he had a simple improvement for the sod cloth design as well. We used the mantis on a couple of four person family trips, and the lack of headroom along the sloping walls forced us to huddle together in the middle. The Mantis worst possible venue was on fine sand. The material was a sand magnet, especially on the inside. When setting up or taking down sand would get stuck to the roof. On the inside. Where it would inevitably sprinkle down onto our head, gear or food. I was not a fan of the Mantis as is, but a few simple and lightweight improvements might have changed my mind. Thanks for keeping this conversation alive. I used a Mantis for another month long Far North canoe trip north of the Arctic Circle and it was great. Perfect no but it's pretty good. Fast to set up. Stable in high winds, rain, hail, and the snow we experienced. Too hot but any shelter would have been so. We did rotate 180 degrees one day when the wind direction spun around.